Three big ideas today: Edit and Delete patterns. Data annotations. LINQ (language-integrated query). Your teacher team has added “comment tokens” to the code examples. We do this to highlight areas of the code that need your attention (and review and thought). Then, when you show your Task List (from the View menu), it will show you a nice list of tokenized comments. Tip: Sort by “Description”, and you can go through the list in the sequence that the author intended. Each item on the list can be double-clicked. When you do that, the source code file will open, and it will scroll to the position of the comment. Like “add new”, this pattern is implemented with two controller methods, and one manager method. ALL use cases that involve data add, change, or delete, will be implemented with TWO controller methods. The GET method will handle the “show me the HTML Form to do add/change/delete” task. The POST method will handle the data that the user sends/submits for add/change/delete. A successful result will ALWAYS use the PRG pattern (post-redirect-get). 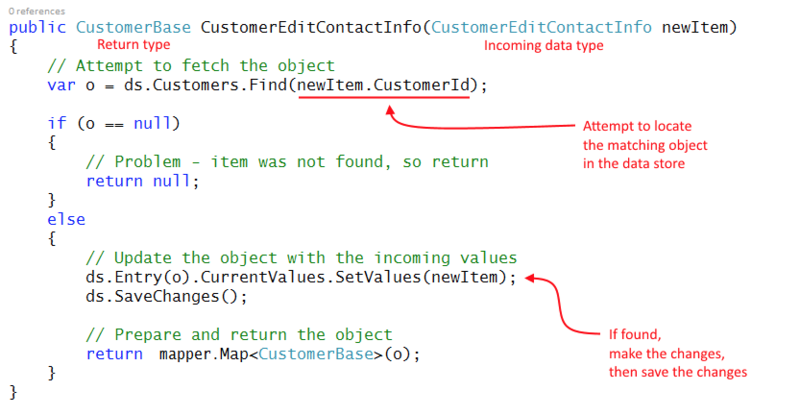 The code example continues to use the customer entity, as we did in last week’s code examples. Then, we must accept the posted data, and process it (by editing the customer object’s data). To preview our work, the controller method will call a manager method, which does the edit-and-save work. The updated object is then returned to the controller, for final processing. We already have some view models, CustomerBase, and CustomerAdd. Can we use these for the “edit existing” use case? CustomerAdd simply will not work, because it does not have an identifier property. Note: For “edit existing” and “delete item” use cases, we MUST have and use the identifier property. CustomerBase could work, for very simple objects, but it would be unusual to do so. Why? From a common sense perspective, we do not usually permit someone to edit all the properties of an existing object in one task. Instead, we focus on the editing task that makes sense for the use case. That means that we will create and use another view model class, to exactly match the shape of the editable object. Pause for a moment, and make sure that you understand this concept. In the code example, we have decided that we will permit the editing of contact info – phone, fax, and email – for a specific customer. The view model class will need these properties. What else? From above, you know that we MUST include the identifier property. Is that enough? If we show an HTML Form with the phone, fax, and email properties, will the browser user see enough to know which customer is being edited? In the view model class, we must also include human-readable and contextually-logical information. For the customer, it seems obvious that we need the customer’s name. However, we do NOT want to allow editing of the customer’s name. Study the following image. Click to open the image full-size in a new tab/window. Don’t worry about this conflict, because we have a strategy. After Visual Studio has scaffolded the view, we will simply edit the view, and remove the ability to edit the customer name. Study the following image. It shows the concept, in action. Click to open the image full-size in a new tab/window. Let’s create the view model class. What name should we use? Well, it will enable the browser user to edit the contact info for a customer, in an HTML Form. Its name will be CustomerEditContactInfoForm. Could we use inheritance here? Make CustomerEditContactInfoForm inherit from CustomerEditContactInfo? Yes, you could. Should you always try to do this? No, only when it’s easy to do, and appropriate. In the controller method (below), we will fetch the object-to-be-edited from the data store. The fetch task will re-use the “get one” method in the manager object. The returned object will be a CustomerBase data type. We will need a new mapping, from a view model CustomerBase class, to a view model CustomerEditContactInfoForm class. Add it now. Do we need another mapping, from CustomerEditContactInfo to Customer? Interestingly, the answer is “no”. Instead, we will use a different mapping technique to do this, explained next. In the method body, our first task is to attempt to locate the object that is being edited. If not found, return null (to the controller). Otherwise, make the changes, and then save the changes. Finally, return the freshly-edited object back to the controller. Here’s a typical “edit existing” method. Click to open the image full-size in a new tab/window. How does this statement work? This is an amazing piece of work. Let’s start at the beginning. That way, you will begin to learn how to read the MSDN documentation. This returns an object which provides access to information about, and control of, an entity (o in this situation) that is in the data context in-memory temporary workspace. Here’s the MSDN document. The ds.Entry object has a CurrentValues property, which gets the current values for the entity’s properties, as a collection of DbPropertyValues. Here’s its MSDN document. The [passed-in] object can be of any type. Any property on the [passed-in] object with a name that matches a property name in the [data store object] and can be read will be read. Other properties will be ignored. Also, it ignores navigation properties. All in all, it is a very safe way to make changes to objects. We will use this for “edit existing” tasks, and maybe other kinds of tasks in the future. As you have learned, we ALWAYS use two methods for “add new”, “edit existing”, and “delete item” in ASP.NET MVC web apps. What data do we need for the form? Enough to enable the browser user to know the context or environment for the work to be done, and the editable properties. Notice the signature of the scaffolded Edit() method. It has an int argument, for the object identifier. Similar to the scaffolded Details() method. This is a best practice – we must get a reference to the object-to-be-edited, and the most reliable reference is its unique identifier. You may have noticed that the scaffolder for the “List” and “Details” views automatically creates an “Edit” link that includes the unique identifier in the URL. To continue, we will use the passed-in object identifier, and fetch the desired object. If not found, return “not found”. Otherwise, create a view model object that will be used in the view to create the HTML Form. Above, we created the CustomerEditContactInfoForm view model class. We will map the source CustomerBase object to this new “form” object. Then, pass it to the view. // Create and configure an "edit form"
As we did for the Create() method that handled HTTP POST, we will change the FormCollection argument, so that we can take advantage of strong typing, and therefore model binding and validation. The first check is done with the same kind of logic that was used in the “add new” situation. Simply check whether model state is valid. If this test fails, then we must display the HTML Form again. 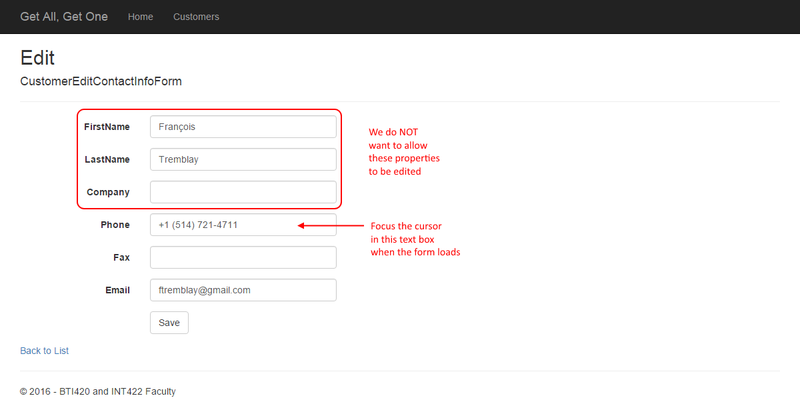 To keep the code simple, and the concept clear, we will simply re-display the HTML Form. Later, we will learn a better and more complete way of handling this situation. The second check compares the identifier in the URL, and checks whether it matches the identifier that’s inside the package of data that was sent by the browser user. If this test fails, then the data (sent by the browser user) was tampered with, so we should redirect, to the list-of-customers view. If both tests pass, then we can attempt to do the update. Call the method in the manager object. If that returns null, then there was a problem with the data, so our initial approach (like above) will be to simply re-display the HTML Form. Later, we will learn a better and more comlete way of handling this situation. Alternatively, if the update succeeds, then we should redirect to the “Details” view, so that the user can see and visually confirm that the edit was done correctly. Like “add new” and “edit existing”, this pattern is implemented with two controller methods, and one manager method. The code example continues to use the customer entity. The HTML Form will show the browser user some information about the item-to-be-deleted, and give them an opportunity to confirm the delete request (or navigate away). If the user confirms the delete intention, then we must accept the posted data, and process it. 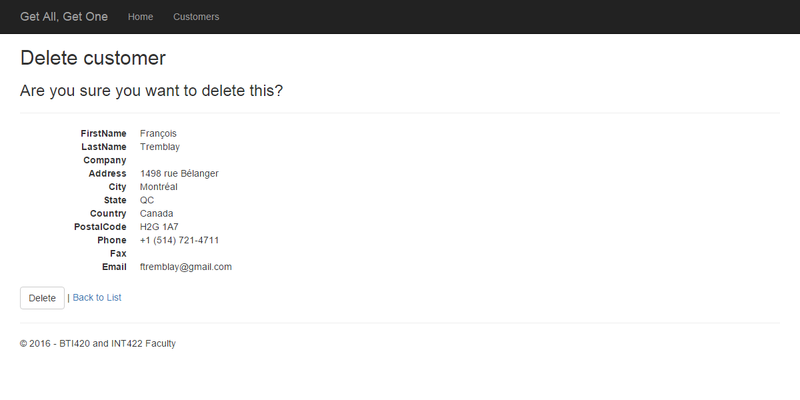 To preview our work, the controller method will call a manager method, which does the delete-item work. This will be a simple method. It needs an argument – the object identifier. Should it return a result? That’s debateable. In this course, we will use a bool return result. The value “true” will mean that yes, the item was deleted. The method’s logic is straightforward. First, attempt to fetch the item to be deleted. If not found, return false. What data do we need for the form? Enough to enable the browser user to know the context or environment for the work to be done. Notice the signature of the scaffolded Delete() method. It has an int argument, for the object identifier. Similar to the scaffolded Details() method. This is a best practice – we must get a reference to the object-to-be-deleted, and the most reliable reference is its unique identifier. You may have noticed that the scaffolder for the “List” view automatically creates an “Delete” link that includes the unique identifier in the URL. If not found, redirect back to the list. Why? We don’t want to give the browser user information that would enable them to “guess” which objects exist, and which do not. Otherwise, we can pass the fetched CustomerBase object to the view. Before testing, you may have to fix the existing list-of-customers view. Why? We may have removed (or commented out) the “Delete” links on that view. Now you can test. Study the following image. Click to open the image full-size in a new tab/window. The incoming data package is effectively empty. We don’t need any data from the user to handle a delete request. The object identifier is in the URL. Confirm this by studying the view and the rendered HTML Form. The controller method will call the manager method, and pass the object identifier as the argument. Effectively, we don’t care what the return result is – true or false – because the result will not trigger any further processing. At the end, we will just redirect to the list-of-customers. Data annotations are descriptive text attributes that we add to properties in a class. A data annotation is a code statement, and is usually located just before/above the property declaration. Open the “DataAnnotations” code example, and study it as you go through this topic. We will also build some examples in class. Note: The Google Chrome browser does a good job of rendering the <input> fields. Some IE and Firefox versions do not offer the same support, unless you use a polyfill. In design model classes, value types (e.g. int, double) CANNOT use the [Required] attribute. Do you need a default value for a property? A data annotation will not help. As before, you can comma-separate multiple data annotations. In view model classes, value types (e.g. int, double) CANNOT use the [Required] attribute, but the [Range(min, max)] attribute effectively solves that problem. LINQ – Language INtegrated Query – is a C# language feature that supports in-language operations on data collections which are located in memory. The operations include the full range of query, add, change, and remove. LINQ works with data collections which are located in memory. Open the “LINQIntroduction” code example, and study it as you go through this topic. We will also build some examples in class. Note that many of the methods require a code expression; which is a function. The function could extract, filter, or project – the developer decides its behaviour.